To achieve the professional designation of PeopleCert ITIL Foundation from the PeopleCert, candidates must clear the ITIL Foundation Exam with the minimum cut-off score. For those who wish to pass the PeopleCert ITIL Foundation certification exam with good percentage, please take a look at the following reference document detailing what should be included in PeopleCert ITIL Foundation Exam preparation. 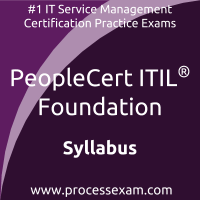 The PeopleCert ITIL Foundation Exam Summary, Body of Knowledge (BOK), Sample Question Bank and Practice Exam provide the basis for the real PeopleCert ITIL Foundation Certification - IT Service Management exam. We have designed these resources to help you get ready to take PeopleCert ITIL Foundation exam. If you have made the decision to become a certified professional, we suggest you take authorized training and prepare with our online premium PeopleCert ITIL Foundation Practice Exam to achieve the best result. - Recognize the responsible, accountable, consulted, informed (RACI) responsibility model and explain its role in determining organizational structure.